Don’t make the mistake of trying to sell your office furniture on your own if your company is downsizing or going out of business. The experts at Business Environments have proudly served the area since 1988 and have developed a positive reputation as a reliable family-owned and -operated office furniture installation company that will help you liquidate your furnishings as conveniently as possible. By turning to us, you can rest assured that no details of the liquidation will be forgotten and you will be able to experience the impressive customer service we offer to all of our clients. 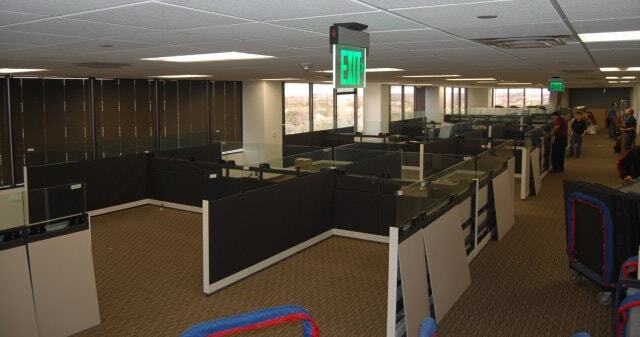 As an office furniture liquidator, we are also able to provide businesses with facility de-commissioning services. In this more specialized form of liquidation, we will remove all of your existing furniture, strip the building of cables and communication wiring, and remove all items from walls. Furthermore, when you partner with Business Environments for any of these services you will be assigned your own project manager who will handle every detail of your project. This person will take care of crafting a unique plan specific to your needs and scheduling all of the services around your busy schedule. To learn more about what makes us stand out as the leading comprehensive office liquidators, please contact Business Environments today. One of our highly knowledgeable team members will happily answer any questions you may have about our services.